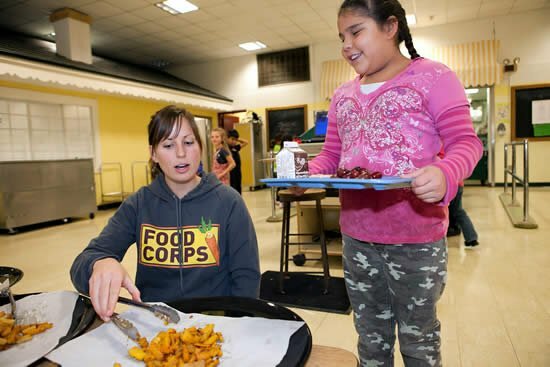 FoodCorps is a nationwide team of leaders that connects kids to real food and helps them grow up healthy. FoodCorps places these leaders in limited-resource communities for a year of public service where they conduct hands-on food education, build and tend school gardens, and facilitate getting high-quality local food into public school cafeterias. Most of the time that’s about introducing kids to whole, unprocessed foods, and helping them get excited about fruits and vegetables. This year, FoodCorps added “FoodCorps Fellows,” former service members who support, guide, and mentor the service members in their state. FoodCorps Fellow Rachel Spencer is in Arkansas, offering support and wisdom (gained from her year of service last year) to service member Ally Mrachek, who is teaching kids out in the garden and working with school nutrition directors to get healthy local food onto cafeteria trays. October Unprocessed asked Rachel to interview Ally (and vice versa) about what inspires them to work with kids and food, and why they believe in the healing powers of kale. You can also find FoodCorps on Twitter and Facebook. Rachel: How does your background in science, nutrition, and health inform your service with FoodCorps? Ally: Everyone deserves food knowledge and good nutrition but access to them is not equal. FoodCorps’ philosophy on health and its program goals are similar to what I believe to be true about health and how to bridge that gap between communities and healthy food. 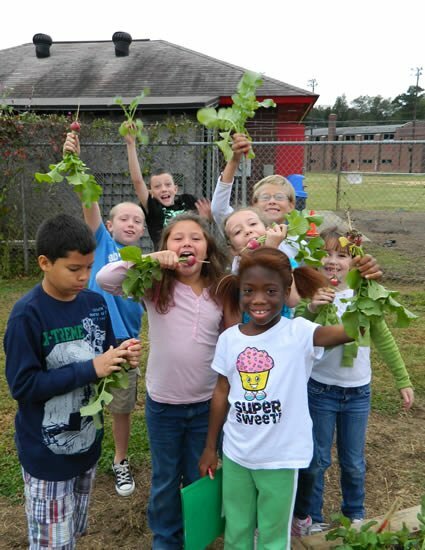 FoodCorps believes when kids can learn about and engage with healthy food, and have access to enough of it, they will grow up to eat more healthfully and make sustainable food choices. 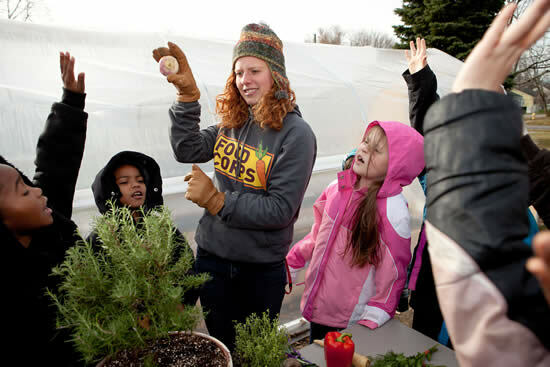 FoodCorps thinks local farmers and school gardens should provide access to this healthy food. That’s brilliant! When farmers can make an acceptable living supported by local consumers, health of the whole community improves. Rachel: Why FoodCorps? Why choose a year of service instead of a traditional job? Ally: I believe strongly in the work FoodCorps is doing and the impact it is having on communities. To me the cause is worth relocating, living on a modest stipend and taking a break from the traditional responsibilities of a Dietitian for a year. Food justice movements that connect people with whole foods are really catching on nation-wide and joining them in their work is a way to make these interventions commonplace. Besides wanting to work outdoors and with my hands more, the experiences I am having and connections I am making will make me a better Dietitian and counselor. I plan to continue working in food insecure and limited resource communities after my service year. Working with schools and in the community, and living on a budget are ways I can better understand barriers to good health in these communities. Ally: What do think kids respond to best in terms trying new, healthy foods? 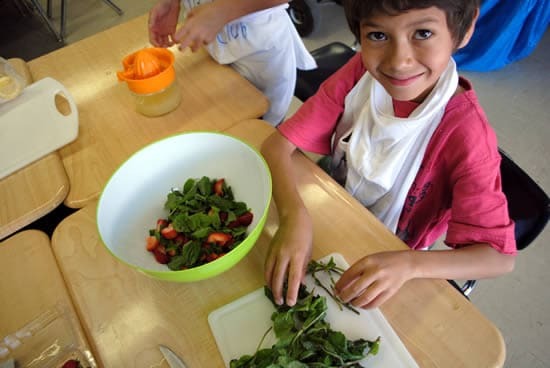 Rachel: Gardening and cooking with kids on a regular basis, I discovered something amazing – almost all of my 200 plus students wanted a chance to try their hand helping me prepare snacks with our freshly harvested garden produce. They loved helping me in class so much I decided to host summer sessions of a “Garden Chef” camp. We would work in the garden in the cooler morning hours, harvest the food we needed for our afternoon recipes, then came inside to the family and consumer sciences room to cook lunch. We worked together to cook a wide range of recipes; at the end of each weeklong session we invited parents and friends to join us for a feast. The parents were astounded to see that their kids successfully made everything from salsa, quiches, risotto, sweet potato fries, kale salad, and so much more. The “ick factor” quickly morphed into curiosity as the kids truly took ownership of their creations. They were far more willing to try new things when they felt that they were part of the process. If I could broadcast a message to the world about kids and cooking, it is that we need to give them more credit, both in their willingness to try new foods and their enthusiasm to prepare them. Rachel: Healthy eating is a habit, and habits can be difficult to form. How do you recommend that people start to make positive changes in the way they eat? Ally: You’re right. At times, eating habits can be hard to change because they are linked to our emotions, our upbringing around food, our culture, and the food values we have. My suggestion is to start with small changes. I know that sounds cliché but reaching small, attainable goals makes for long-term lifestyle changes. Starting small can make daunting, seemingly difficult changes easier. For the Unprocessed Challenge, I suggest choosing one or two things that are highly processed in your diet and finding an alternative for a month. Once those substitutes are part of your lifestyle, choose another food to change. That way your goals are easily attained and you’ll feel less deprived. Ally: Do you believe engaging people around the process of cooking food can lead to healthier eating? Rachel: I absolutely do. I believe that we as a society have been sold the message that cooking is work, and that investing time in that work is undesirable. One of my favorite things about cooking is that it reminds us we have to follow the laws of nature. No matter how much you need your zucchini cooked to tender perfection within the next three minutes, it will take however long it takes. Rachel: So, it sounds like you believe enjoying and appreciating food can lead to healthier eating habits. Why do you think that is? Most memorable experience in the garden. Ally: On cooking day in garden club, students make a healthy snack and do a “quick write” about it. They use their five senses to describe the snack. Their vocabularies are improving and I love talking to them about what they taste, smell, see, etc. It is a simple way to appreciate and eat mindfully, even if they don’t like it. In club, it’s okay to not like something and we ask them to be polite when describing their dislike. We call it “don’t yuck my yum.” We encourage, but do not force, the kids to try unfamiliar foods; it’s important to keep the experience stress-free. They rarely refuse to try any of the new produce we have offered them. When kids learn about their snack and take part in planting and tending it in the garden, they are more likely to eat it when it’s on their plate. They are learning how to listen to their bodies and become competent eaters. This skill develops healthy eating habits and healthy kids. I think adults can benefit from the practice of mindful eating as well. Using the five senses and taking note of when the body is hungry and full are healthy eating habits. It makes eating more enjoyable and the meal fully appreciated. Ally: Thus far, what has been your most encouraging moment when working with kids? Rachel: Thankfully, there have been quite a few. Last year after a salad tasting one of my students told me that they used to think Sonic made the best food in town, but now they knew that garden food was the best. Another one of my kids told me that he hated store broccoli, but he loved garden broccoli. He followed that comment by saying he did not like store beets, but would probably like garden beets. I also received a lot of positive feedback from parents about the recipes I would send home with kids. Many adults told me that they had never thought of cooking cauliflower the way we did in class, and that their child now loved foods they had refused to try before. One girl told me that she made pesto using our class recipe, and that the only bad thing about it was that her grandfather finished off most of it before she had a chance to enjoy it! I always loved hearing that kids were taking the things we learned in class back to their families. I think that is when we start to see real change. Ally Mrachek is a Registered Dietitian, Master Composter and FoodCorps Service Member. She graduated with a Master’s of Science in Food Science and Human Nutrition from Colorado State University. She recently moved from Seattle, WA to Fayetteville, AR for a year to serve students, local farmers and the community in partnership with the public school district. Rachel Spencer is originally from Fayetteville, GA and graduated from the University of Georgia with a Bachelor’s of Science in Environmental Health. Last year, she served with FoodCorps at Marshall High School in Marshall, AR, and this year she continues her work with FoodCorps as a fellow at the National Center for Appropriate Technology in Fayetteville, AR. 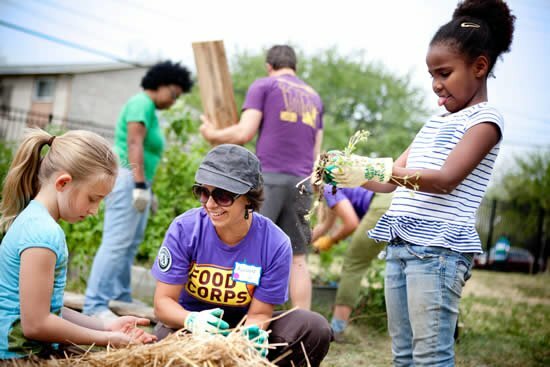 I’ve been looking for something like this to get involved in, I’m going to check out Foodcorps. Great post! This is awesome! As a weight loss coach myself, my efforts are focused mainly on the children. I am definitely going to have to look more into this. Thank you so much for sharing.